Duke School is an independent preschool through eighth grade project-based school. We inspire learners to boldly and creatively shape their future. Duke School serves as a leading educational institution both within the Triangle and wider educational community. The Admissions Office at Duke School is committed to helping families find the right school by taking a personal interest in getting to know each applicant and his or her family. We also want to learn about your educational goals and to provide you with a comprehensive understanding of the school, our curriculum, and overall culture. Duke School offers learning through project work, small class sizes, and a rigorous academic approach. Our integrated curriculum is taught in a hands-on learning environment where children collaborate in an atmosphere of acceptance, respect, and appreciation. Duke School is an exciting place for all. We strive to not only engage with our families, faculty/staff, but to also stay connected to our alumni, grandparents and Duke School friends. We hosts special events for each of our constituents, and trust that you will find Duke School a friendly place, where meeting new people is easy and your own talents and interests are embraced. ﻿WE ARE DRAGONS...WE ARE REAL! The Duke School experience is not only special for our families, but for educators and non-Duke School friends as well. We offer a Collaborative Arts Program for non-Duke School students, a Project Institute workshop for educators, as well as a summer camp program with over 60 camps that is open to the public. Connect and explore with us today! Duke School's Development Office oversees fundraising, events, Parent School Organization and alumni relations. We are dedicated to support the school's mission by securing financial resources, nurturing lifelong relationships, and developing a deep love and respect for our community. Welcome! Duke School is pleased to offer great summer camps for everyone in the Durham and Chapel Hill area! Each summer, Duke School hosts seven weeks of exciting summer programs for children and youth ages 4 to 15. We provide a variety of enriching opportunities consistent with the values of Duke School, including active inquiry, collaboration, intellectual and personal growth and respect for our community. Whether you are already familiar with Duke School, live nearby or are in the area visiting, we welcome you to join us for one week or several, you never know what you'll learn! Our campus is easily accessed from Raleigh, Cary, Durham, Chapel Hill, and Carrboro. Duke School Summer Camps are closed on Thursday, July 4, for the federal Fourth of July holiday. Camp sessions that occur during the week of the Fourth of July are pro-rated. Pro-rated fees are reflected at the time of registration. Duke School does not pro-rate for partial attendance or absence from a summer camp program. Camps with low enrollment four weeks prior to the start date may be removed from the summer camp schedule. If this occurs, Duke School will contact families and offer the option of transferring to a different camp. A full refund will be issued if Duke School cancels a camp. All deposits are non-refundable. On June 1, payments are non-refundable. Questions? 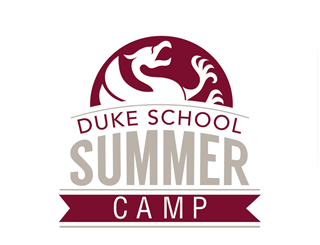 Send an e-mail to camps@dukeschool.org or call (919) 493-2642. Between 4-6 PM call/text (919) 748-1468. List of 11 frequently asked questions. Q. What are Duke School's Summer Camp hours? Q. Who can register to attend camps? Camps are offered for children and youth between the ages of 4-15. Register your child based on their age as of June 1, 2019. If your child's birthday is near the cut-off date and you are interested in registering, please e-mail us at camps@dukeschool.org. Q. What is the Early Bird Discount? The Early Bird discount is $10 off each camp session, and is automatically applied when you complete your registration during the discount period (January 29-April 1). Session changes may be made during the discount period and the discount will be maintained. However, any changes made to a camper’s session schedule after April 1, will result in loss of the discount. Q. What is the payment policy? Our online registration system accepts Visa and Mastercard. If you prefer to pay by another method, you must register in person at Duke School. We cannot hold your child's space in camp until we have received payment. Camp deposits are 35% per camp, and are non-refundable. Full and final payment for all camps is due no later than June 1. Registrations submitted after June 1, must be paid in full at the time of registration. Changes in a camper’s schedule may result in full loss of payment for the original program. Payments lost due to withdrawal from a program cannot be forwarded to the next year’s programs or to a sibling’s account. Q. What are the cancellation and refund policies? When you register for camp, you will be asked to pay at least 35% of the camp fees as a deposit. This deposit is non-refundable. Should you decide to cancel your registration before June 1, Duke School will reimburse funds paid in excess of the deposit. You must request this cancellation in writing before June 1. On June 1, no refunds will be given and full payment is due. This policy applies to Kids Club and Camp Discovery aftercare programs as well. A $25 processing fee per camp is required for all refunds. Payments lost due to withdrawal from a camp may not be transferred to a sibling or applied to a program offered outside of the current summer season. Duke School reserves the right to cancel any camp based on enrollment or other circumstances. Should Duke School cancel a program in which your child is enrolled, you will be offered a 100% refund or credit toward another camp. Duke School reserves the right to substitute instructors, add or remove activities, and to alter camp schedules as necessary. Refunds, in full or part, will not be made as a result of program change or modification. Q. My camper is sick. Do you prorate camp payments if my child misses camp due to illness? Duke School does not prorate or refund camp fees for partial attendance. Camp days missed due to illness may not be made up during subsequent camp sessions. For the safety of all campers, please notify the Duke School Summer Camp office if your child is ill and will be absent from camp, call us at (919) 493-2642. Q. What if I need to make changes to an existing registration? All changes to an existing registration (other than adding weekly aftercare) will result in a $25 administrative fee. This includes: switching sessions of the same program, switching to a different program for a week for which you have already registered, and/or switching to an entirely new week and program. All balances are due by June 1. After June 1, in addition to the $25 administrative fee, any program balance must be paid in full at the time the change is made. All deposits are non-refundable. Full payment is due on June 1, and no refunds are available after that date. This policy applies to Kids Club Extended Day programs as well. If changes to registration are made more than one time, multiple administrative fees will apply. No scheduling changes may be made within two weeks of the camp start date. Q. What are your expectations for campers? We expect campers to demonstrate respect toward all camp staff members and fellow campers at all times while attending Duke School camps. We expect campers to act responsibly, be kind to others and follow simple instructions. While we offer great programs for most children, we recognize that we may not be the best camp or have the appropriate support in place for all children, especially those who require special medical, behavioral or social support. All preschool campers must be potty trained before attending camp or aftercare. There are no exceptions to this policy. If you have questions about whether Duke School offers the suitable camp experience and supports for your child, please e-mail us at camps@dukeschool.org. Attendance at summer camp is contingent upon your child's ability to exhibit and maintain acceptable standards of behavior and citizenship. There is no refund if a camper is asked to leave camp due to behavioral problems or for disobeying camp policies. Electronics, including games, iPods, cell phones and ear buds of any kind isolate individuals from the purpose of spending time together and making meaningful connections. We ask that if your child brings a cell phone or electronic device of any kind to Duke School Summer Camps that it remain in a book bag or tote so that it is not accessible during the day. Any participant who uses an electronic device during the day will be asked to put it away. Q. What should we bring to camp? Where do I drop off/pick up my camper? All families will receive an e-mail approximately two weeks before the start date of camp, which will include a campus map, the camp location, details on drop off and pick up and what to bring for camp. Q. How do I reach camp staff members during the day? E-mail camps@dukeschool.org, or call (919) 493-2642.